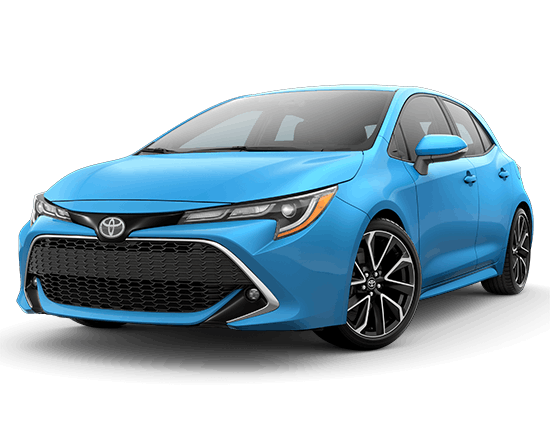 Lease a New 2019 Corolla Hatchback for $199 a month for 36 months with $2999 Due at Signing. LOW MILEAGE LEASE. TAX, TITLE, LICENSE, DEALER FEES AND INSURANCE ARE EXTRA. DUE AT SIGNING INCLUDES $2,800 DOWN, FIRST $199 PAYMENT, AND NO SECURITY DEPOSIT. DOES NOT INCLUDE $350 DISPOSITION FEE DUE AT LEASE END. EXAMPLE BASED ON 2019 COROLLA HATCHBACK MODEL 6272, MSRP $22,050 AND CAPITALIZED COST, WHICH MAY VARY BY DEALER, OF $21,735. CAPITALIZED COST IN EXAMPLE INCLUDES $650 ACQUISITION FEE AND ASSUMES DEALER PARTICIPATION. YOUR PAYMENT TERMS MAY VARY BASED ON FINAL NEGOTIATED PRICE. OFFER AVAILABLE ON APPROVED CREDIT TO QUALIFIED CUSTOMERS FROM TOYOTA FINANCIAL SERVICES. CUSTOMER IS RESPONSIBLE FOR EXCESSIVE WEAR AND EXCESS MILEAGE CHARGESOF $.15 PER MILE IN EXCESS OF 30,000 MILES. NOT ALL CUSTOMERS WILL QUALIFY. OFFER MAY NOT BE COMBINED WITH OTHER OFFERS UNLESS SPECIFIED OTHERWISE. DEALER FEES ARE EXTRA. VEHICLE SHOWN MAY BE PROTOTYPE AND/OR SHOWN WITH OPTIONS. ACTUAL MODEL MAY VARY. DELIVERY MUST BE TAKEN FROM DEALER STOCK BY 4/30/19 AND IS SUBJECT TO AVAILABILITY.